It was a sweltering day, with blurred eyed shoppers navigating through our local farmer’s market. My son howled for strawberry lemonade — waiting in a long line with a squirmy three-year-old, keeping patience among a herd of thirsty adults was a challenge. “Why do we wait mommy?” My son pleaded, shoving to the front of the line. “Because other people are thirsty too. Look, here is a mommy; she will have a baby soon. She needs lemonade for the baby and she is in front of us.” I smiled at a clearly exhausted very pregnant mom, who also had a toddler anxiously squirming. I offered my son water. He shoved it away and paused, wide eyed. “BABY IS THIRSTY!” he shouted “Go go mommy, baby thirsty.” The whole line laughed. The mom and I began to have the typical pre birth chat. When is your due date? How was your first birth? She asked about my birth. “He was very late,” I said. “Did you have a C-section?” The mom asked with a sympathetic look on her face. “Oh have you read that book that talks about how bad C-sections are for a baby? I had no idea of the consequences for an infant’s health. Are you feeding him different foods so he doesn’t develop allergies.” She paused awaiting a reassuring answer. “I didn’t have much of a choice.” I said looking at her with raised eyebrows, trying to convey my surprise and annoyance. “Well did you save your placenta for encapsulation? You know that’s critical for his immune system,” she said raising her voice. Thankfully it was our turn at the front of the line so managing the lemonade order abruptly ended the conversation. I fully expected her to follow me down the street. Perhaps because I live in California I am more prone to these types of encounters. From conception well into childhood, parenthood and the decisions we make become part of the public conversation–our actions, or lack of them, become judgment of our character, our capabilities as parents and by extension competence and respectability as adults. This is not my only public assault I have experienced. It has occurred frequently around whether or not to have a second child. I have a physical disability, but it may not be apparent unless someone sees me use my arms or if I am having a particularly bad day and I have difficulty walking. On days I look “able bodied,” I have been urged to have another child, questioned why I don’t have one yet, scolded for depriving my child of a needed sibling. In one of the worst experiences, I had a grandmother follow me through the mall telling me of the advantages of a second child and providing all of the consequences for my child’s future because of my selfish behavior. None of my explanations provided relief of this verbal assault. It wasn’t until my son literally ran away did I escape. Many people would say, ignore these people; tell them it is none of their business, it’s easier said that done when at times it occurs on a weekly basis. For a variety of reasons, none of which are disability related, I most likely won’t be having a second child. This is a heartbreaking decision and I am very aware of both the pros and cons. I have a sibling and always thought my child would have the same. I have had to accept my decision and mourn the “loss.” Yet, the healing and acceptance of this decision is painful when my choice is part of public conversation and private urging by friends. As if this isn’t challenging enough I have to deal with people’s opposite judgment when they discover I have a disability. Why is public judgment of parenting so present and yet help with the daily tasks of parenting in general not part of community support? It takes a village to judge parents on how to raise a child, but we do not have a village to help us care for them. Anne became a mother in 2013 to an enchanting baby boy. Her joy for her son was over shadowed by her experience with navigating the health care system in ways she did not expect. Her dream is to create support services for new mothers so no one has to experience what she went through. She is also a Disability and Health Policy Consultant. Her experiences in navigating the complexities of the health care system and identifying providers to deliver quality care has made her an advocate for people with disabilities. As a disability advocate she emphasizes working within the health care system in order to empower consumers to have a direct impact on the delivery of care. 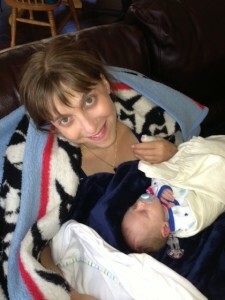 Through her blog she explores the joy and struggles of learning to be a mom. Along the way she hopes to share some of her stories as a mom with a disability, not for pity, not to be an inspiration but because it is a fundamental part of me. Anne is a spastic mom that frequently spills milk and rebels against the notion of “Leaning In.” she prefers to recline with a cup of tea!